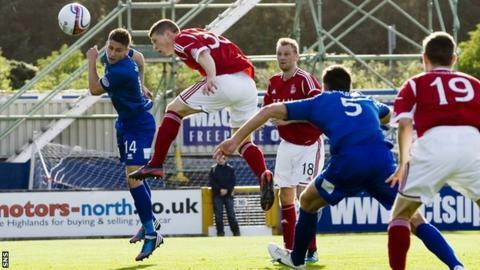 Aberdeen youngster Cammy Smith says his mum and dad will still be delighted about his first goal for the club - despite missing out on seeing it. The 17-year-old scored the equaliser in a 1-1 draw with Inverness Caley Thistle. But his parents had decided to watch brother Andrew playing for Highland League outfit Keith instead. "They will be gutted they were not here but delighted that I have scored," Smith told BBC Scotland. "My dad has followed me everywhere, all over the world, but he thought I would not get on today and decided to watch my brother instead and come to see the game against Peterhead in midweek." Smith also came on as a substitute a fortnight ago against St Mirren, but his header from a similar position struck the underside of the bar as the Buddies escaped Pittodrie with a 0-0 draw. "I was delighted to see that go in," said the striker of his maiden goal. "Last week, it was just too high for me and, if it had been an inch lower, it would have went in." Smith made his first-team debut as a 16-year-old on the same ground in April. He understands that Craig Brown has to retain a core of experience in his side but is grateful to the manager for giving youth a chance and is ready for action if called on again. "If they put me in the team again, I will be ready for it," he said. Brown was delighted for Smith following that near miss against St Mirren. "He is a modest young guy and will do very well in his career," said Brown. "He went close from a very similar position last week and, if that had gone in, that would have been four points from two games instead of two." Brown thought a draw was a fair result but was critical of his side's start to the game. "The first half was our worst performance of the season, but I told them at half-time they had to go out and do better and they were much better after the break," he added.